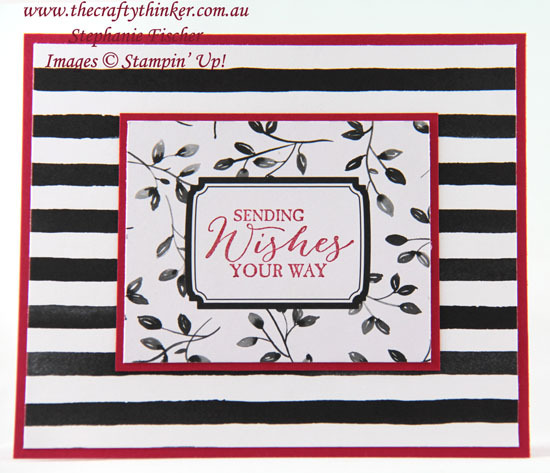 I love the bold contrast of colours in this card and the simplicity. The Petal Passion Suite is so elegant and easy to use! The base card is Real Red cardstock, followed by a layer of striped paper from the Petal Passion Designer Series Paper pack. Another layer of Real Red frames the pretty, leafy card from the Petal Passion Memories & More Card Pack. The label in the centre is a sticker that's included in the Memories & More pack and I stamped a greeting from Butterfly Basics in Real Red ink. Cards don't get much quicker or easier than this, I think, but it's still very effective!